Some pet owners have concerns about flea and tick medications not working as well as they used to, worried their pets are still getting fleas even after using vet recommended medications.For many people, they are not only man’s best friend, but a part of the family, and people will do whatever they can to keep them safe from fleas and ticks.“We use Trifexis, which is just one pill once a month,” said pet owner Vania Thompson.Thompson brings her dog Prancer to the dog park every day and keeps him on a specific regimen to keep the pests away.“I like the one pill, once a month, done,” she said.She has not had any issues, but veterinarians say they are hearing more complaints about flea and tick medicine no longer working.“It’s really tough to say from our standpoint because there’s really no research supporting that, but it is something that we hear commonly,” said Dr. Wesley Keele at Central Vet Hospital in Knoxville.They say the issues they see are people buying products that are not vet recommended or not using them properly.Vania Thompson brings her dog Prancer to the dog park every day and keeps him on a specific regimen to keep the pests away.“They got it from a human pharmacy, a big box store. They didn’t get it from a veterinarian, and there’s no way their dog or cat is on Frontline anymore. 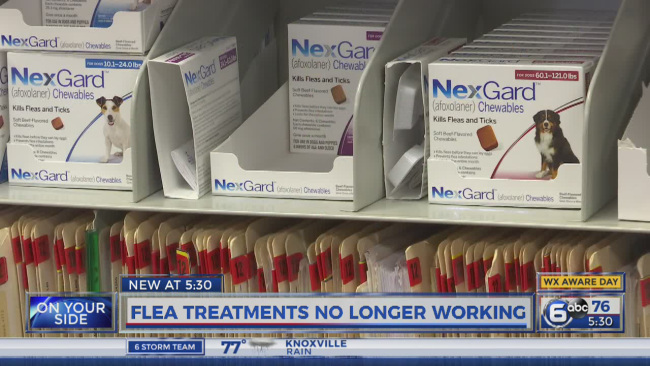 It’s receiving one of the generic versions of Frontline,” said Keele.Veterinarians say it is always important for your pet to be on flea and tick medication even if it is mostly an inside pet, but they say it’s really important for them to be on flea and tick medication if they’re going to be around other pets like at a public dog park.They say no matter the case, you should always consult your veterinarian to find out what may work best for your pet.“We try to kind of tailor or individualize the flea and tick plan to the individual pets,” said Keele.Veterinarians also say most vet recommended flea and tick medications come with a guarantee, meaning if you follow the correct dosage and all pets in your house are on the medication, the company will pay for an exterminator if your pets get fleas.